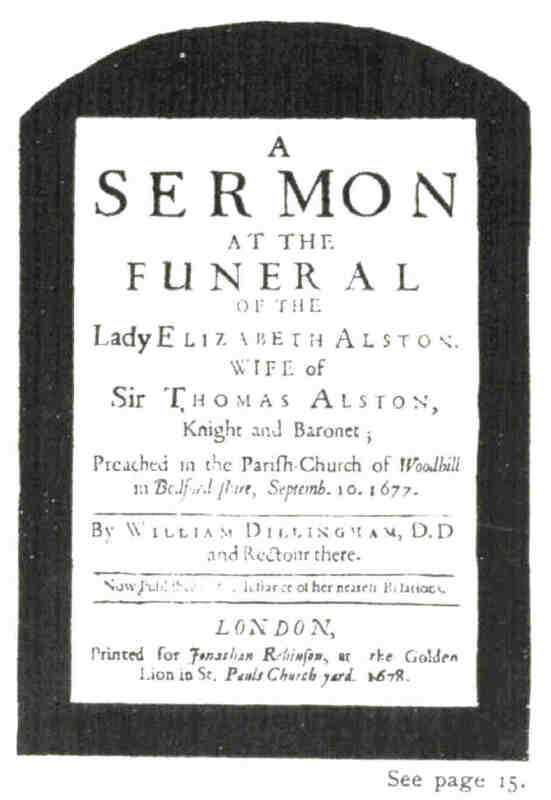 A sermon at the funeral of Lady Elizabeth preached by William Dillingham DD at Woodhill Church Bedfordshire on the 10 Sept 1677 conflicts?. Published at the instance of her nearest relations. Lond. 4to 1678 pp. 44. The first Sir Thomas of Odell was an important county, if not national, figure. His establishment at Odell Castle was more impressive than the Alston home in Pavenham. In 1671, he paid hearth tax on fourteen hearths, twice as many as were levied on Berrystead Mansion. He was a member of parliament when the Civil War broke out in 1642. He gave his support to the ordinance putting Charles I on trial and remained in parliament after his execution. Bedfordshire was divided in its loyalties, but Sir Thomas was one of a band of county parliamentarians which included the Earl of Kent and John Vaux. He was a member of the Midland Association, an amalgamation of eight counties set up by parliamentary ordinance to raise forces, not always an easy task as military service was unpopular and the people of the countryside found themselves politically unenthusiastic about either side of the contest. Ref . PAVENHAM, The Life story of a Village, by Rachel Marchbank.